If something is on video, it's probably on YouTube, and thus this is the first place to go when you want to find some media content. 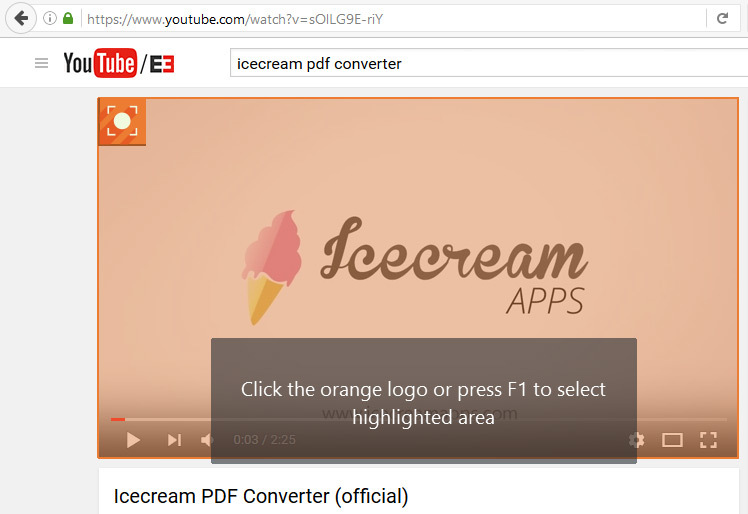 If you don’t have a YouTube downloader installed on your computer or want a shorter version of a certain video without editing it, you can capture this video with Icecream Screen Recorder, i.e. record it directly from your screen. This article will explain you how to use this program to capture YouTube video. 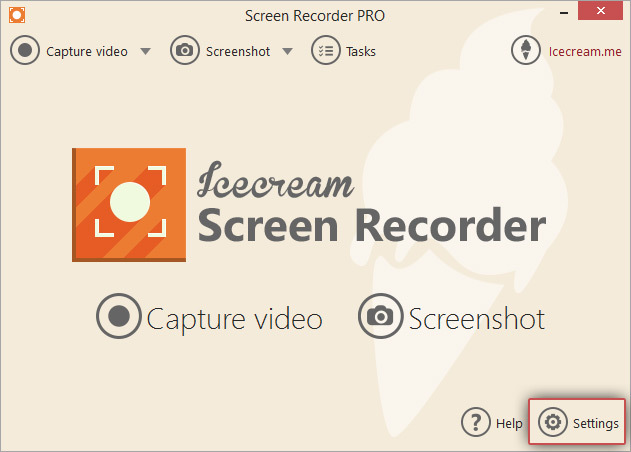 To download Icecream Screen Recorder, just click the “Download” button on this page. Save the setup.exe file on your computer and activate it to proceed with the installation. It’s a standard process that is easily completed in a few steps. Installation Wizard will guide you through the process in half a minute and after that you can open the application to capture YouTube video. Open the Settings panel by clicking the “Settings” button in lower right-hand corner of the program's main window. 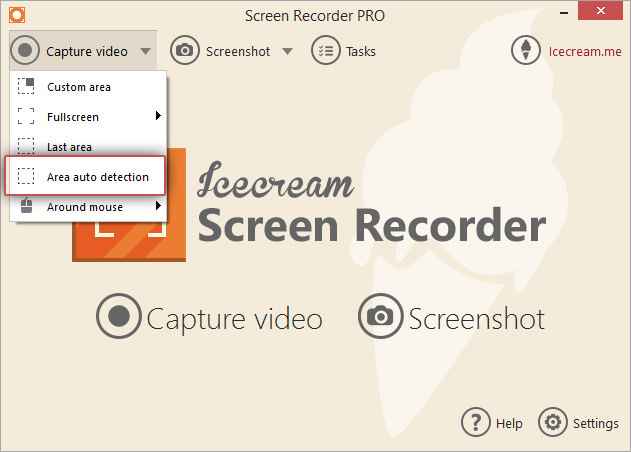 Icecream Screen Recorder offers multiple needed video, audio and general settings along with the hotkey combinations. All these settings are organized by 5 tabs: System, Save to, Video, Audio and Hotkeys. You can read more about the customization of all the settings offered by the program here: How to Change Recording Settings. 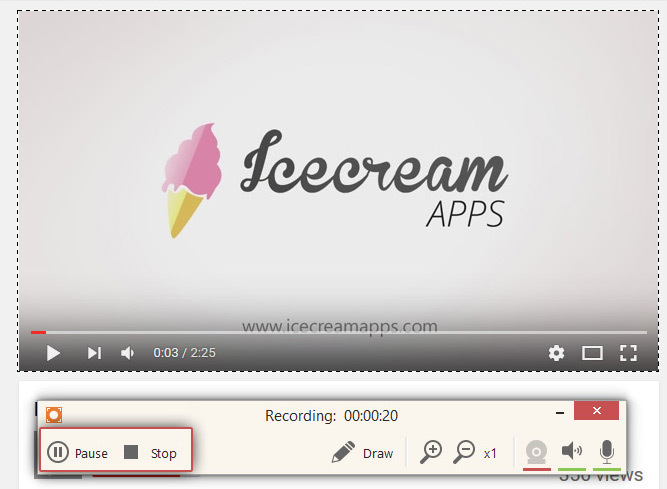 Open the YouTube video you wish to capture and click the “Capture video” button in the upper left hand corner to open the drop-down menu with the recording modes offered by the program. We recommend using the “Area auto detection” recording mode for easy selection of the borders of a YouTube video to be recorded. Click this option from the menu to proceed. Hover your mouse over the selected YouTube video and let the program automatically select the recording area with “Area auto detection” recording mode. 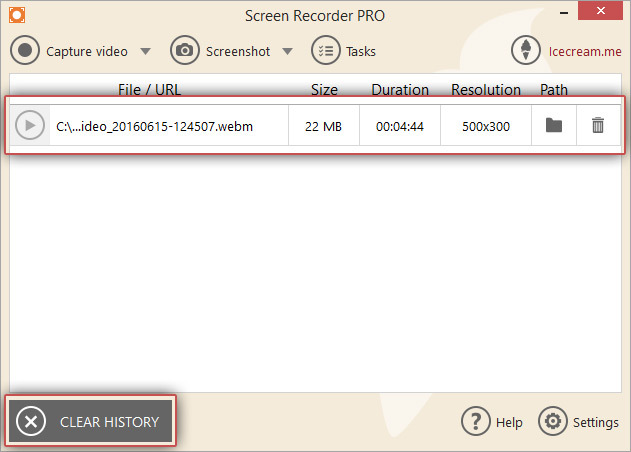 When the right area is selected, click the orange logo of the program or F1 button to apply the frames of the recording area. In case you wish to adjust this area, you can do that by means of the recording panel (make sure the “Area” button on the recording panel is active). 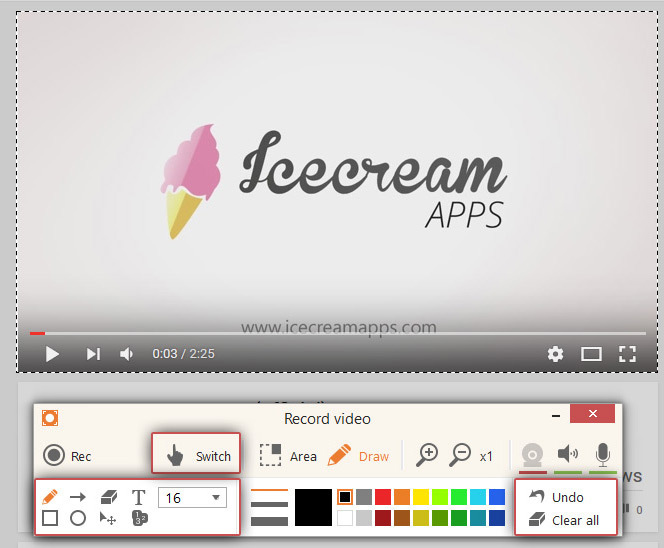 Pressing the “Switch” button will activate the desktop while recording the video so that you could access your computer's facilities, open other tabs or programs, and control the windows. There is a “Draw” button on the recording panel – feel free to use it if you want. Particularly, you can opt for brush tool or tools like oval, rectangle, arrow, step tool or text. The “Undo” and “Clear all” buttons are located at the right-hand side of the window – use them to cancel the changes. Once it’s all set, click the “Rec” icon to capture YouTube video right away. The video will start with the countdown in case the “Show countdown” option is enabled, and then the actual recording will be started. All the icons and controls described above will be active during the recording until you stop the process. All the drawings and text will be displayed in the output video in just like they appear on your screen. If you want to rewind or forward the YouTube video or skip a certain part, you can pause the screen capture process by clicking the “Pause” icon in the upper left-hand part of the control panel. To resume the process, hit the “Resume” button and the video will be recorded again from the moment it was stopped. 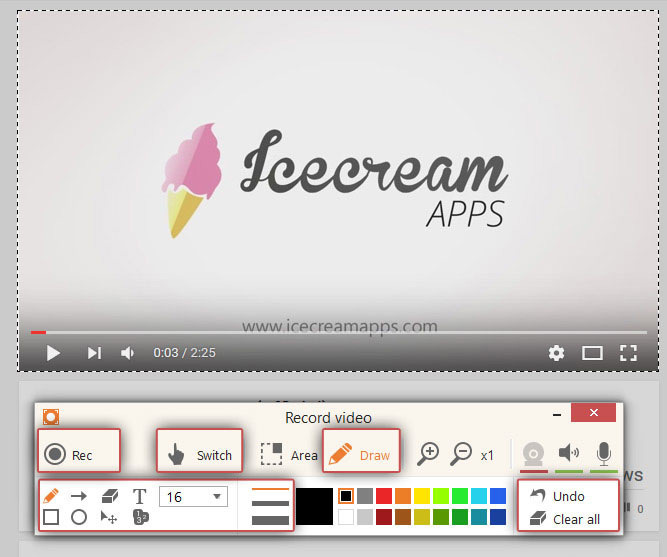 When a YouTube video reaches its end, press the “Stop” button on the control panel to finish capturing the video with Icecream Screen Recorder..
After that, you’ll see a popup notification in the bottom right corner of the screen (unless you disabled “Show notifications” option in the program's Settings. Click the folder icon in this window to open the file in a containing folder. Alternatively, close the control panel and click the folder icon in the “Path” column (you can find it in the chart in the main window) of the History panel of the program.